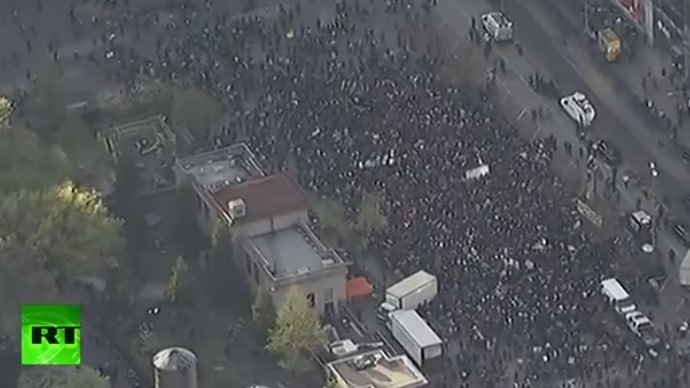 The arrests come after hundreds of people gathered in New York's Union Square to rally against Gray's death and in support of those in Baltimore. The NYPD had warned participants that marching into the streets or blocking sidewalks could result in arrests. More than 60 people were arrested throughout the night, an NYPD spokesperson told Reuters. Police are charging many of the protesters with disorderly conduct, according to CNN. At various points of the evening, protesters made their way to locations such as Times Square, where arrests were also made, and the Holland Tunnel, where traffic was disrupted. “People of Baltimore have taken to the streets day after day for justice for Freddie Gray and for Black lives across the country but now that the National Guard has been called in and a curfew set, we must stand in solidarity with the people of Baltimore,” the group wrote on the Facebook page for Wednesday’s event. Hundreds of protesters showed up to Union Square to begin the rally. Prior to the rally's commencement, police used loudspeakers and distributed flyers warning demonstrators that they could be arrested if they walk in the streets or block the sidewalks. Speaking with the Washington Post, one local activist described the motivation behind the event. “We wanted to come out and show our solidarity with folks who are protesting for Freddie Gray in Baltimore and continue to bring national attention to this, and not allow for this, like any incident, to be treated as isolated to one city,” said Eugene Puryear. Several hundred people turned out, where protesters were set to march to the White House. Gray was a 25-year-old American who died in police custody as a result of a severe spinal cord injury. It’s unclear how Gray sustained the injuries, though police have said that timely medical care was not given and that the young man was not secured by a seatbelt when placed in the back of a police wagon. Federal and local investigations are ongoing, but protesters have taken over Baltimore streets nightly for the past week or so. The majority of the rallies were peaceful, but rioting and looting on Monday pushed the mayor to implement a weeklong curfew and for the Maryland governor to declare a state of emergency.